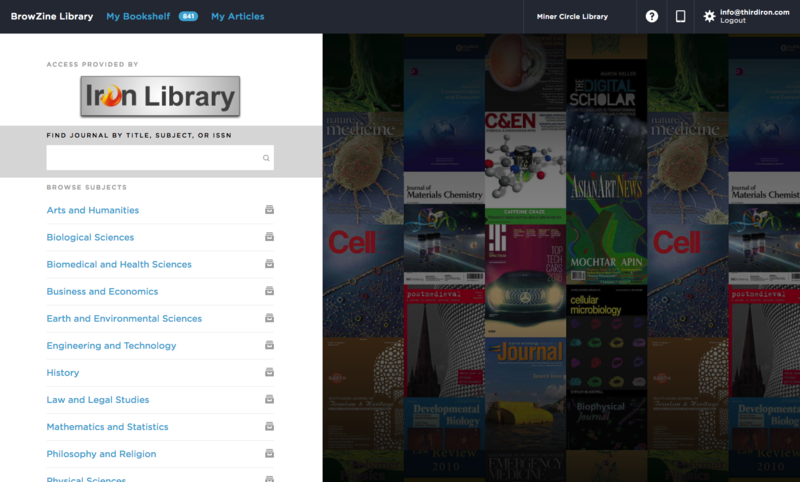 The BrowZine classification system was developed with the goal of enhancing browsability of journals in the BrowZine app. The development process recognized that users need a way to quickly identify journals in the app relevant to subject areas of interest, and that the navigation requires multiple entry points in a hierarchy that ranges from broad subject area (eg, Physical Sciences) to granular (Astrophysics). Further, the terminology needs to work across (1) institutions that use varying conventions for naming academic programs and/or have dissimilar ways of organizing subject access in the institution’s library; and (2) publisher portfolios that use varying conventions for subject classification of titles. Finally, the classification system must be flexible and extensible. In building the classification system, existing taxonomies (in particular, the National Academies’ Taxonomy of Fields, the National Center of Education Statistics Classification of Instructional Programs, and the Berkeley Press 2011 Taxonomy of Academic Programs) were consulted, along with the classifications schemes and subject vocabularies of well-known subject-specific bibliographic databases, as well as Library of Congress classification authorities. Also extensively researched were the presentation of serials listings on library websites of large institutions in particular and the subject organization of publisher catalogs and websites. The BrowZine Taxonomy is a living taxonomy that is being revised as the BrowZine Journal List grows to achieve the aims of the above goals. For this reason, additional shelves and categories may be assigned or deleted from time to time just like any other classification system. Additionally, we welcome (and have received) input from Librarians, Faculty, Physicians and Publishers to help make journal discoverability as successful as possible. The titles classified in this bookcase are the peer-reviewed titles identified as “Essential Core” and “Research Level Core” in the Core Public Health Journal – Version 2.0 maintained by the Public Heath/Health Administration (PH/MH) section of the Medical Library Association. For more information on this project, please visit the website of the PH/MH section. The titles classified in this bookcase are the peer-reviewed titles currently covered in PubMed/Medline that US National Library of Medicine has classified as core clinical titles. For more information, please visit the PubMed website. The titles classified in this bookcase are the peer-reviewed titles from the 3rd edition of the ‘‘Basic List of Veterinary Medical Serials’’ developed by Ana G. Ugaz, C. Trenton Boyd, Vicki F. Croft, and Katherine M. Anderson, and published as “Basic list of veterinary medical serials, third edition: Using a decision matrix to update the core list of veterinary journals,” in the Journal of the Medical Library Association (2010, 98(4), 282-292. DOI: 10.3163/1536-5050.98.4.004) The ‘‘Basic List of Veterinary Medical Serials’’ was established by the Veterinary Medical Libraries Section in 1976 and last updated in 1986. The Medical Taxonomy is an alternate taxonomy option designed specifically for Medical Institutions which focusses primarily on medically related subjects. The scheme is informed by the Collection Development Manual of the U.S. National Library of Medicine. The bookcases are drawn primarily from those currently aligned in Biological Sciences and Biomedical Sciences, and a few others from Engineering and Technology, Mathematical and Physical Sciences, and Sociobehavioral Sciences. Titles that a library has outside of this taxonomy will still be visible using A-Z search. 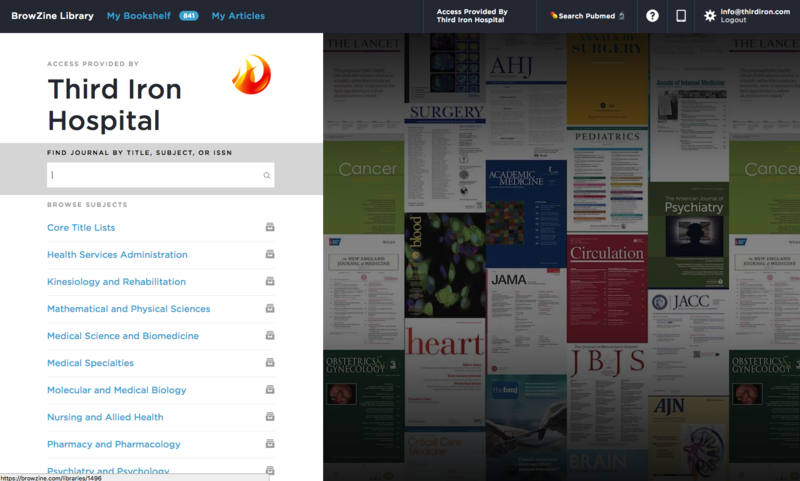 In additional the medical taxonomy features a unique collage of titles, drawing from many of the most influential titles in the medical field. To switch your account to use this taxonomy just contact support at support@thirdiron.com. In addition to these two main taxonomies, a library may choose to further refine the presentation of BrowZine for their users by limiting the subject areas at the TOP LEVEL of the taxonomy. For example, if they are using the main taxonomy but the nature of their collection means they have extremely little Law and Legal Studies materials, that taxonomy area (and all of the elements beneath it) can be suppressed. This means that option will not appear in BrowZine web or in the mobile apps. However, journals within those taxonomy elements will still be available via the title search. This helps ensure the material is still accessible while tightening the focus of BrowZine for your users. To make this switch, contact support at support@thirdiron.com.